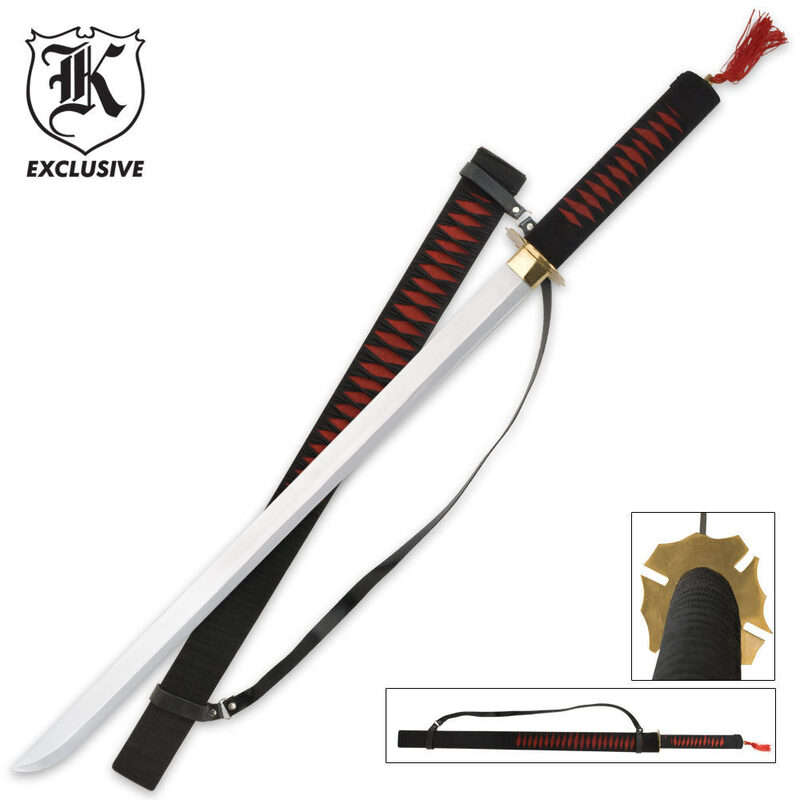 Red Warrior Ninja Samurai Ninjato Sword & Sheath | BUDK.com - Knives & Swords At The Lowest Prices! 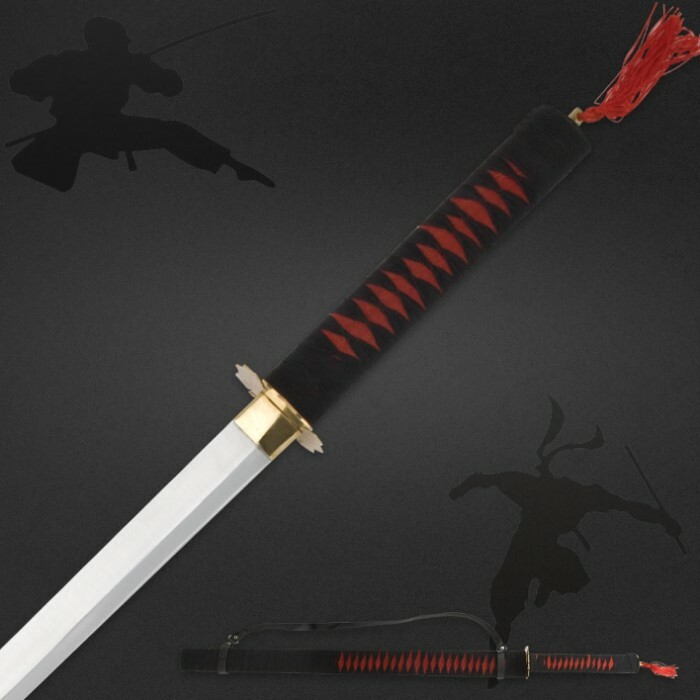 This Red Warrior Ninjato is the perfect sword for the edged weapon enthusiast! Measuring 37" overall, this sword features a brass guard and hardwood handle wrapped with black and red cording. The 27" stainless steel blade is tree-splitting sharp and heat tempered. This piece also includes a hardwood blade scabbard wrapped in red and black cording. When I received this sword the tassel on the handle look like those troll dolls hair, the handle was twisted from not being tightened down completely and worst of all when the sword is pushed fully into the sheath the blade sticks out the other end!!! While the first two are minor inconveniences the last one is unbelievable! I have bought a lot of things from Budk and have been very satisfied with the quality of what I have bought. I was very disappointed in this sword. It is a pretty cool sword. The blade however was not anywhere close to "tree-splitting sharp". The actual cutting part of the blade was thicker than a butter knife blade. About the only thing this sword could cut would be butter. Other than my disappointment with the blade, it is a cool sword to have around for fun. I actually had one of these for several years, to this day im suprised how practical this sword was comparatively to the 30 dollar swords you see all over the place. definitely not to flashy by any means but for a practical starter sword why not? the cord will come off after a few months and the sheath will start to seperate but literally 12 years later i still have it. This sword was great! No mess ups at all, pristine weight, though cardboard shavings were everywhere it was overall good. I bought this sword as a wall hanging, but was impressed by the appearance of the blade. The blade is straight as can be with a nice finish. With a little sharpening, this blade could serve double duty as an impressive home defense weapon. What kind of an intruder charges you when you are holding this sword? Very happy with it. Unbeatable price. Recommended. Great buy for the $..... Just in case, it's nice to have around! you truly get what you pay for I would not buy it at all one swing and it fall apart a show off sword at best I would not buy it all.